A Vertical Playing Field | Fit Families | Kids VT - small people, big ideas! Bouldering — rock climbing without ropes — with kids is in some ways easier than hiking with them. It's an indoor-outdoor activity that levels the playing field — a vertical one —and may even give little ones a leg up on their parents. 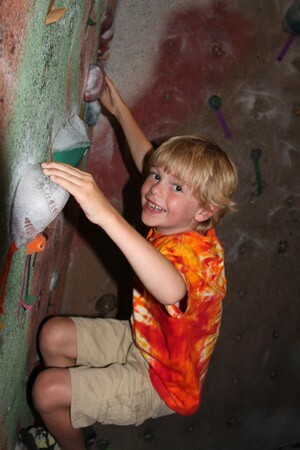 I recently headed to Petra Cliffs Climbing Center in Burlington with my cousins, 5 and 8. We got bouldering day passes and spent the afternoon trying out routes on both floors of Petra Cliffs' bouldering area. One side of the center houses towering, two-story climbing walls. The bouldering area is a little less intimidating; the ceilings aren't much higher than the ones in my living room. I watched as my cousins clambered fearlessly up the faux rock walls. Because kids are light and flexible, gravity doesn't scare them — yet. Plus, they can avail themselves of handholds and footholds too small for adults. Nothing builds confidence like blowing past the grown-ups. But the adults have the mental advantage in this sport. Negotiating a vertical route requires planning and concentration. You can get stuck in a spot where a seemingly reachable handhold turns out to be a little too far away. Shifting your body weight slightly, or changing the order of the footwork, may lead to a solution. Kids have a harder time getting out of such situations. When my cousins got stuck on the "boulder," they quickly let go and dropped to the floor. Trying it again, faster, didn't solve the problem, either. As they take on and conquer increasingly difficult routes on the wall, then graduate to outdoor climbs, kids build strength and strategic thinking skills. Petra Cliffs climbing camp counselor Ben Yardley says he enjoys watching that happen. "If they do the actual route [marked with tape on the boulder], they have to figure out which hand goes where, and which foot goes where. Otherwise, it will be much harder," he says. "It's cool to watch them figure it out." Fear doesn't factor into the exercise. Whereas real rock climbing is risky, requiring protective ropes and harnesses, bouldering at Petra Cliffs doesn't require scaling much higher than an adult's arm reach. They provide crash pads in case of falls — a comfort, no matter how old you are. "We try to make the environment as safe as possible," Yardley explains. When teaching kids, he reassures the timid ones with a little demonstration: "I'll put two pads down, climb up to the top, and I'll fall on my back to show them it doesn't hurt." 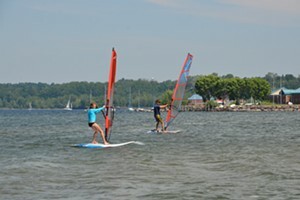 "Fit Families" is a monthly feature that offers easy and affordable ways to stay active. Got an idea for a future FF? Email us at ideas@kidsvt.com. Sky Barsch Gleiner is the publisher and editor of Vermont Sports magazine and vtsports.com. She lives in Orleans with her husband and pets, and is appreciative to have adventurous cousins here in Vermont. Ages: Kids can start at 2 - or 3, or whenever they have sufficient motor skills to cling to a rock. Little ones shouldn't climb higher than their parents' reach, so that parents can get them down safely. Equipment: Wear comfortable clothes that allow you to move easily. You'll also benefit from rock-climbing shoes, which are available to rent at Petra Cliffs for $5. Chalk, which helps you grip the handholds, is available for $2 at Petra Cliffs. Cost: A bouldering day pass at Petra Cliffs costs $9 for kids 11 and under, $11 for students 12 through college age; and $12 for adults. If it's your first time, tell the staff and they'll give you a brief bouldering orientation. On the wall: Routes — aka "problems" — are denoted by colored tape, and each has a difficulty rating. Those labeled Vfun or VO are the easiest. Try to follow the route by using only hand- and footholds that are demarcated with the same color tape. Don't forget to place a crash pad at the bottom of your route — that is, of course, after making sure no one is using it!